SUPAFRIK #7 Coming to Toronto! 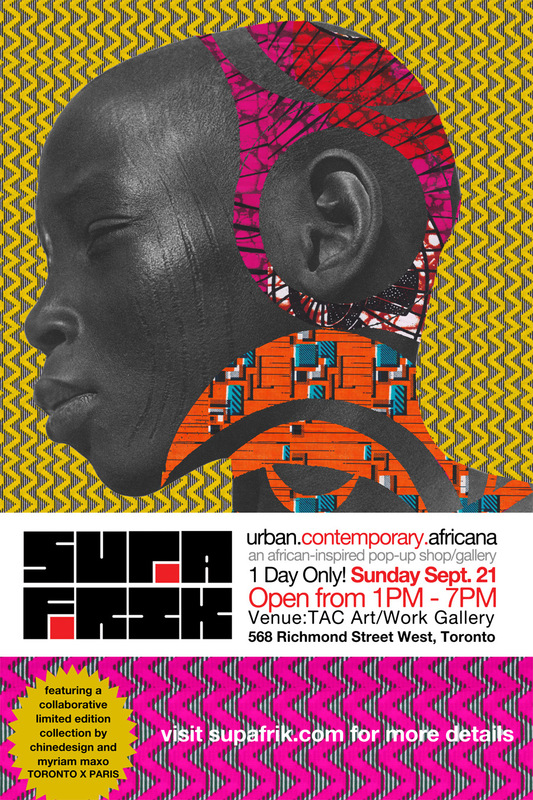 SUPAFRIK returns to its Toronto roots after well received installations in Washington DC, London and Paris. 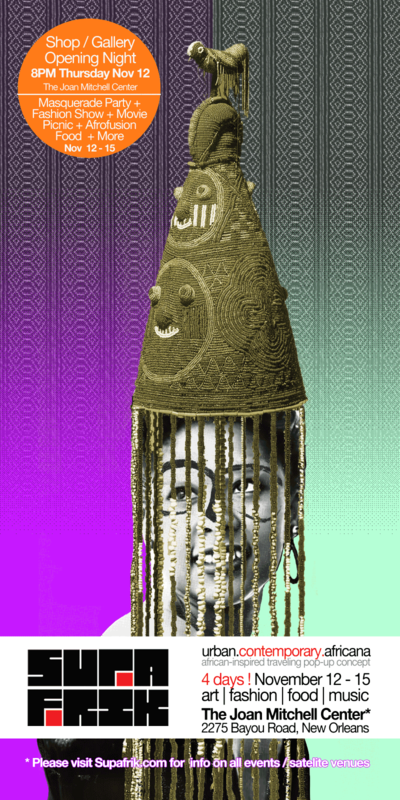 With a limited edition focus, SUPAFRIK #7 will feature a collaborative one-off capsule collection from Chinedesign and Parisian conceptual artist MyriaMMaxo (renown for her riotously colorful “objet d’art” waxprint teddies) who will also be in town to launch the collection. Chinedesign’s #TheBravingRitual collection, the label’s first foray into eclectic winterwear combining tartans and indigo-dyed mud cloth will also be exclusively available for made-to-measure custom orders. Also featured: luxurious handwoven scarves from newly-minted Ethiopia-based African Design Hub label which will be making its Canadian-debut at SUPAFRIK roster. SUPAFRIK will also feature a tasting menu of Afro-fusion culinary delights by Zimbabwean cook Rufaro, original artwork by Oluseye and a preview of BLKKANGAROO’s BLKKMARKET, its first capsule collection of structured t-shirts and unisex kaftans inspired by the color, texture and vibrancy of the West- African market experience. For bargain hunters, there will also be discounted goodies from the online store from such as UK based clothing “Made in Africa” label Chichia London (Beyonce is a fan!) whose street-smart collection is ethically manufactured in Tanzania using traditional kanga textiles as well as fashion sneakers from Mos Def’s new favorite shoe brand SAWA, designed in Paris and made in Addis Ababa. Our Holiday Gift Shop Launches Tomorrow! If you missed us at one of the pop-ups in Toronto or Washington DC don’t worry you know that we got you! We’ve been listening to your requests. Starting tomorrow you’ll be able to shop the SUPAFRIK pop-up online! We’ve cherry picked the best sellers from the past four pop-up shops and added a few surprises as well. New merchandise will be added at the start of the day, everyday for the 8 day duration so check back often for a chance to snap them up. When we say qualities are limited, we mean LIMITED. If you are still looking for that unique gift for your friends, family or yourself, wait till you see what we have at the SUPAFRIK Holiday Gift Shop! Tune in to: SHOP.SUPAFRIK.COM to travel around the world in 8 days from December 13th to the 20th.